Ocean Glow Sensory Shaker Musical Toy is rated 4.4 out of 5 by 27. Discover the rattle that delights all your baby’s senses. The jolly jellyfish responds to your baby’s movements and rewards their curiosity with a color-changing light show and classical melodies. 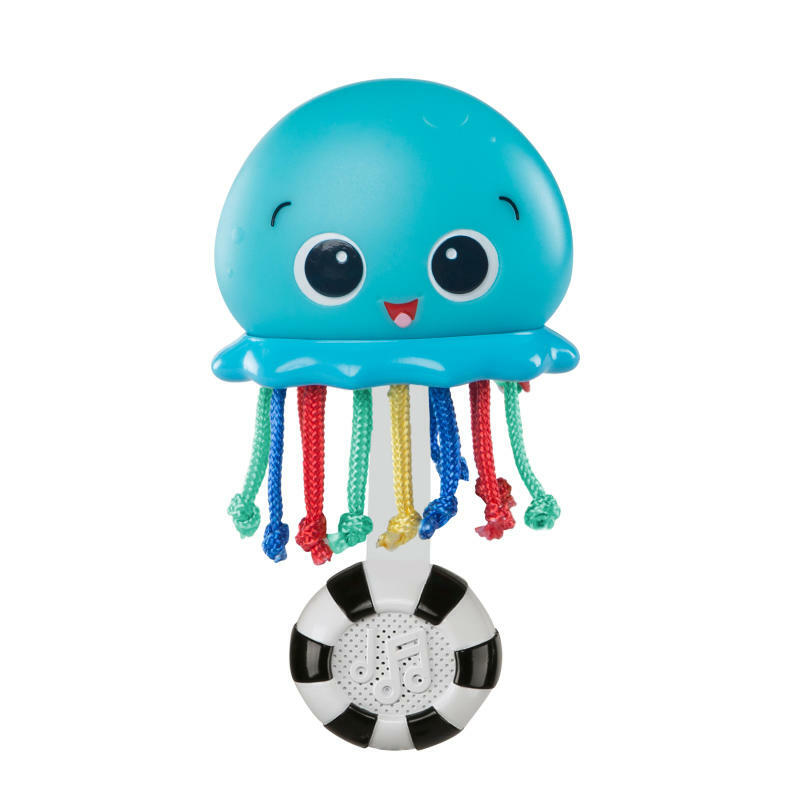 Encourage baby’s tactile development with textured rope “tentacles.” Made just for little hands to grasp, the Baby Einstein Ocean Glow Sensory Shaker Musical Toy makes the perfect companion as a take along toy. Dimension (in) 1.86" x 3.1" x 6"
Rated 3 out of 5 by Iteach4379 from Great toy, needs better battery. My daughter LOVED this! But i gave it 3 stars because less than a week after purchasing it, the battery is almost dead. After purchasing, i pulled the battery separator out so i know it wasn’t being used for months in the store. Rated 3 out of 5 by Iteach4379 from Great toy, needs better battery. My daughter LOVED this! But i gave it 3 stars because less than a week after purchasing it, the battery is almost dead. After purchasing, i pulled the battery separator out so i know it wasn't being used for months in the store. Rated 5 out of 5 by Dmb1031 from Love My son loves this toy! The lights the sounds and Mom likes that it has an on/off button. Rated 5 out of 5 by Mellie2015 from Best toy ever! I love this sensory toy. The colors and the way it shakes and makes an eye catching sound is amazing! Rated 3 out of 5 by Malmighty from Cute but no longer working Fun toy for getting ready for bed , glows and makes sounds. However it stopped working after the 3rd day. Rated 5 out of 5 by Griffing83 from Love the Glow! My daughter loves this Ocean Glow Shaker! Every shake illicits a new glowing color change. It's a simple to use but enjoyable sensory toy. Rated 5 out of 5 by Aly144 from Awesome rattle alternative I received this toy in exchange for an honeat opinion. I would say the best part about this shaker is that it is easily activated by a small movement, which in my opinion helps to engage all children especially when they are younger. The octopus is so cute and the fact that the light changes colors as it plays music is really cool. We loves Baby Einstein in our house, so the familiar classical tunes are great! Even at almoat two years old, my daughter loves to play with this toy.